Carissa Saunderson, emergency room doctor for MSF. Johannesburg — August 9 is Women's Day in South Africa - a day where women across South Africa celebrate the progress women from all walks of life have made in social, economic and political spheres in the country. 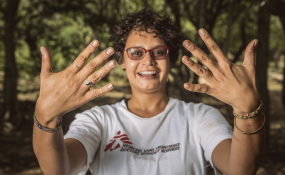 For this day, Doctors Without Borders (MSF) highlights the progress and accomplishments made by three of their woman fieldworkers who have worked in some of the 65 countries in which MSF operates. Here's the stories of Zani Prinsloo, a midwife, Zanele Dhludhlu, a finance director and Carissa Saunderson, an emergency medical doctor. Zani is a midwife who has worked all around the world for MSF delivering babies and training fellow midwives since six years. She has worked in South Sudan, Sierra Leone, Pakistan, Afghanistan, Iraq, Syria, the Philippines, Pakistan, Lebanon, Greece and Kenya. In total, she has delivered an estimated 1,500 babies in her time with MSF, with the majority being from Afghanistan and Pakistan. The first baby she delivered during her first, and favorite, assignment with MSF was in Khost, Afghanistan back in 2012. Her job with MSF has taught her how to save lives with limited resources especially in conflict-afflicted contexts. She recalls a time in South Sudan when her team turned intravenous bags (IV bags) into hot water bottles, filling them with warm water in order to keep the sick pre-term babies warm at night. In most of the different locations she has delivered babies, Zani has been honoured by mothers as they have named their newborns after her. “I have so many babies named after me I have almost lost track. I believe most of them are now in school. For me this is a huge honour. I still get photos of some of these babies from my fellow MSF colleagues working in these countries and there is nothing that makes me happier to know they are doing well and growing,” says Zani. Zani says what keeps her going and motivated are the resilient and strong women she meets during her assignments. “There are so many mums who have struggled to have babies and those who have lost babies at child birth, so when I manage to help them to at least have one baby, they are always grateful. These women inspire me to keep saving lives,” says Zani. “Working in a primary clinic was different to what I was used to doing back home in an emergency room in Cape Town where, for example, you could request a chest x-ray, do some simple bloodwork or refer a patient to an appropriate department or facility altogether. Not in Mayom. We have to think more, to use clinical judgement, our stethoscopes, and our hands. At the beginning it was stressful. But not instantly resorting to special investigation taught me to be more critical from a clinical point of view. By making us think a bit more, and really weighing our options and discuss a case, in the end this makes us better clinicians. Some cases were also very challenging. I remember a young mother who came in five months pregnant, severely jaundiced, with high blood pressure and an altered mental state. Although we tried to support her as much as we could, her liver failed and in three days we lost both the patient and her baby. I would lie if I said that it was easy. But thanks to wonderful leadership and a great team, I came to remember that, in the end, it’s only ever about the patients; whatever the outcome. And you can only ever do your best. But it also taught me to focus on the good we are able to do for the many others who recover and survive. With minimal facilities, MSF is able to provide extraordinary healthcare in Mayom. My time there taught me that you don’t need to rely on fancy technology, that you can learn so much just by talking to others, and that you can alleviate a lot of suffering just by sharing yourself and being compassionate. By providing a little bit of care, a little bit of effort, it makes a major difference. I remember one particular patient – a feverish, malnourished baby who had severe diarrhoea, was very dehydrated, and nearly in shock. His mother had been struggling, alone and in vain, for a week before bringing him to the facility. The team was able to help by giving him IV fluids and medicine, and monitoring his progress, doing sponging and providing supportive care. Eventually this tiny person improved. The gratitude on this mother’s face spoke volumes. It was unlike anything I had ever seen. Without me being able to speak her language nor her being to speak mine, she called me over. She reached behind her neck and took her necklace, and insisted I have it. My knee-jerk reaction was to decline the gesture since it was a team effort and I’d been singled out. But something stopped me when I realised that, it was her most prized possession and she wanted to show her gratitude. Refusing it would have been an insult. With much protest, I accepted. I wore it immediately and for days after. Actually, the other day I wore it to my cousin’s wedding. Should my house burn down, I’d grab my dog, Chocolate, and that necklace! In the end, when it was time to finally leave Mayom, I was grateful that I stayed. Moreover, I even toyed with the idea of requesting an extension for my assignment. The small things we often complain about, pale in comparison. Zanele Dhludhlu works as the Finance Director of MSF Southern Africa and she has been with the organisation for over 10 years. She has worked both in the our Johannesburg office and in the field projects as a finance officer in Zimbabwe as well as a logistician in Khayelitsha, South Africa. Today Zanele is the first black female finance director in MSF's international movement. From working in a pioneering MSF project in Khayelitsha treating HIV during the years of AIDS denialism in the early 2000s; to setting up MSF’s first office in Africa in 2006 along with four other colleagues; to being responsible for an annual multi-million rand budget at the leading medical humanitarian organisation in Southern Africa, Zanele has really worked hard to get where she is. A year later, she quit a secure job and a promising career at the head offices of a major clothing retailer in Cape Town to volunteer at MSF as a supply and logistics officer for six months. Motivated by the tragedy that her family had faced and the desire to help people in need, Zanele didn’t let the prospect of not having a stable job deter her – she told herself that she’d work hard to make sure that she would become indispensable. During her decade long journey she dared to dream and saw the impact of how individual acts of humanitarianism can change lives and bring hope to communities in South Africa and abroad. “Humanitarianism has always been a part of our lives in South Africa; we just called it Ubuntu. Ubuntu to me means being aware of your surroundings and what people are going through, having empathy and doing what you can to help each other cope with situations and find a way to survive. When you are inside MSF and you see what we are doing, you see that this is also ubuntu. It’s not as localised, it’s more international, but the principles are all the same. Copyright © 2018 Medecins Sans Frontieres. All rights reserved. Distributed by AllAfrica Global Media (allAfrica.com). To contact the copyright holder directly for corrections — or for permission to republish or make other authorized use of this material, click here.